How do I set default programs? I know how to set default web, mail, calendar, music, video and photo-viewing software (by opening System Settings) but I'd like to be able to set my default PDF viewer. 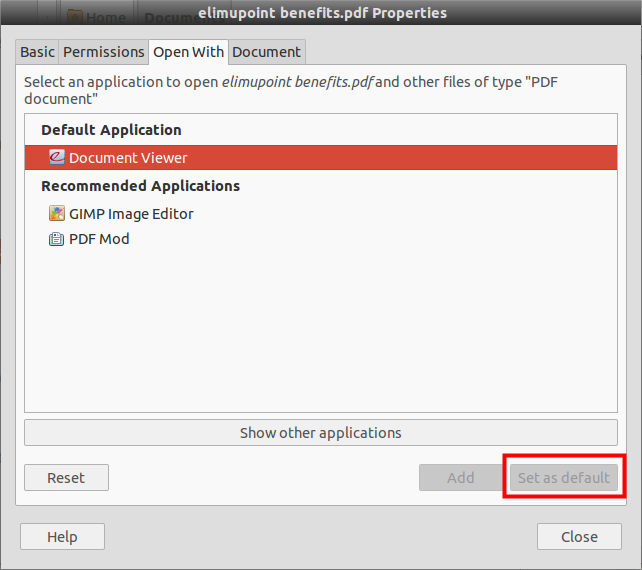 Right click on any pdf file and choose Properties. Under the 'open with' tab, you will find the applications to open PDF files. Choose your application of choice and then press the 'set as default' button in the right bottom corner. Right click on any pdf file, in the menu select "Open with...", then select the app that you like to open pdf from the list. Now clicking on any PDF file it will be open in the selected app. Not the answer you're looking for? Browse other questions tagged default or ask your own question. How do you globally set the default browser using KDE4? How can i set Lotus Notes as the default mail program? Unable to set Chrome as the default browser; what else can I try? How to set QMMP to play - not enqueue - with double click?